Don’t Be a Donkey Tail! The donkey tail plant, A.K.A. 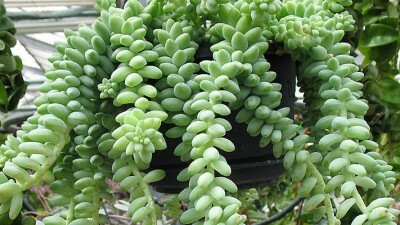 burro’s tail, is a Sedum, and its species is s. morganianum. It is a native to southern Mexico and Honduras; however, it grows well in a pot on my back porch. The leaves easily fall off the stems if you just lightly brush up against it. The donkey tail plant is fragile! This word “fragile,” has led me to ponder and consider what it means when applied to people. One definition of this word particularly strikes me, “weak, liable to fail, easily destroyed” and related words such as “susceptible, vulnerable, and yielding.” All people, including followers of Jesus Christ, have a thing or things that make them fragile. I have to look no further than to what tempts me. The Apostle Paul wrote to the Corinthians recounting the Israelites’ 40 year trip from Egypt to Canaan being marked by their giving into the craving of evil things which displeased God. Paul told them that the Israelite’s history was given as an example of what God’s people were not to do (1 Corinthians 10:1-11). He completed this part of his letter with these words, “Therefore let anyone who thinks that he stands take heed lest he fall. No temptation has overtaken you that is not common to man. God is faithful, and he will not let you be tempted beyond your ability, but with the temptation he will also provide the way of escape, that you may be able to endure it” (1 Corinthians 10:12-13). Paul’s first sentence of these verses reminds me that I should not have confidence in my own resources to resist a temptation. He then gives a common denominator I have with other people, the same temptation I experience others have experienced it as well. The promise he states in the last sentence of these verses allows me no excuse for giving into a temptation. God will provide a way out. In all that he does, he prospers” (Psalm 1:3).